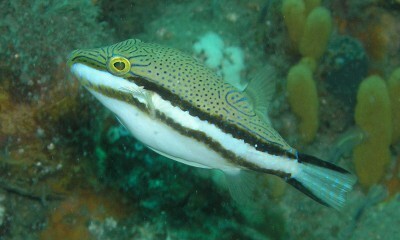 Bennett's Toby is a variety of puffer fish that comes from the Canthigaster family. These fish varieties are largely found in Indo-Pacific and they are moderately hardy in stamina, moving singly or in small clusters in secluded inshore silt reefs, docks and ponds in a depth, ranging from 1 meter to 12 meters. The Bennett's Toby breed is also called as Bennett's Sharpnose Puffer, and it is semi-violent in nature. Usually, when bred in an aquarium, they prefer a tank with a maximum capacity of 55 gallons, with the temperature of the water, ranging from 77 degree Fahrenheit to 79 degree Fahrenheit, with the water salinity between 1.020 and 1.023. The Bennett's Toby fish breed is a semi-violent fish that attains a maximum body length of 9 cm when matured. These fish varieties have a variable-colored body and it is covered with a poisonous mucus, so if the flesh or skin of the fish is consumed, it can be lethal to humans. When endangered, they will inflate similar to a football to discourage predators. Bennett's Toby fish varieties are similar to the behavior of bigger puffers, but they come in an extremely small package. Usually, these fish breeds do not perform well with other Toby fish except they are a mated couple. These fish varieties are also recognized for fin nipping, and they habitually harass other tank companions. Bennett's Toby fish varieties are omnivores, and they feed on algae and plant matter in the wild. In the aquarium, they are fed with filamentous algae and meaty foods. The maximum lifespan of the Bennett's Toby fish breed is 5 years.